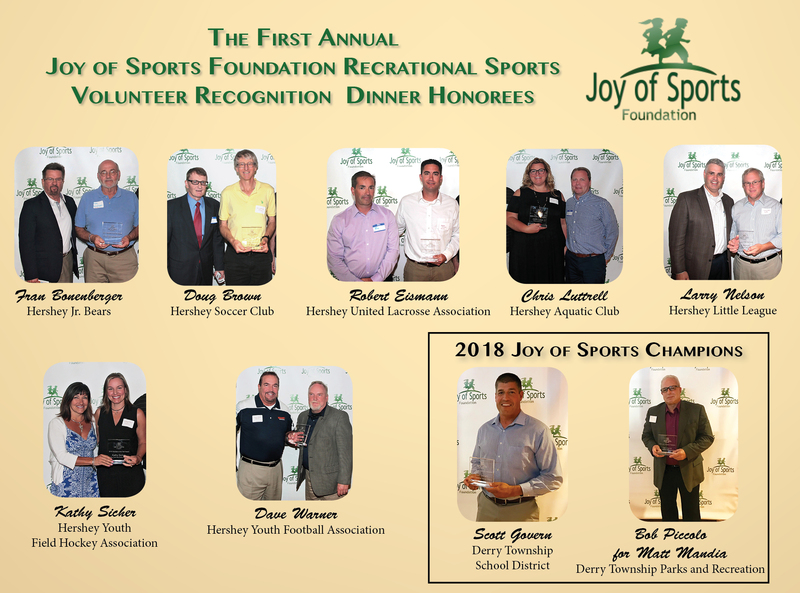 On Thursday evening, June 14th at Purcell Friendship Hall, the Joy of Sports Foundation (JSF) held its First Annual Rec Sports Volunteer Recognition Dinner. The event was held to celebrate youth rec sports and the volunteers who make rec sports possible. In partnership with the township’s recreational organizations, JSF honored seven individuals who had been selected by their organization as exemplary volunteers. JSF also provided special recognition to two individuals who have been champions through their leadership to the local recreational sports community. Chris Luttrell, Hershey Aquatic Club – Chris has been a fixture in youth aquatics development not just in Hershey, but in the region for over 30 years. Her career has included numerous board and committee assignments at both the club and league level, as well as service on the HAC board as both a director and president. Fran Bonenberger, Hershey Jr. Bears – For over 50 years Fran has been a major factor in the operation of the Hershey Jr. Bears House League. In addition to being the current Vice Chairman, Fran has served on the Board of Governors for more than three decades, holding the role of President for many years. Kathy Sicher, Hershey Youth Field Hockey Association – Kathy was one of the founding mothers to develop the Hershey Youth Field Hockey Association. Kathy has shown tremendous leadership by nurturing the League into what it is today, bridging the gap between youth & high school and developing a summer youth camp. Dave Warner, Hershey Youth Football Association – Dave has served as a coach at some level for all 20 years he has been involved; serving as the Head Coach of the Midget program for over a decade. He is a past HYFA Board member and an incredible advocate for the kids and HYFA. Robert Eismann, Hershey United Lacrosse Association – For the past two decades Robert has held leadership positions throughout the entire girls lacrosse program, including new tournament development. Robert helps with scheduling, manages league artwork and graphics, and represents Lacrosse at league meetings. Larry Nelson, Hershey Little League – Larry serves as lead for the functions of field maintenance and concessions with Hershey Little League, and has been an Assistant Coach for three years. His involvement has helped HLL in making significant improvements to all its fields. Doug Brown, Hershey Soccer Club – Doug is a dedicated volunteer for the Hershey Soccer Club, serving the Club by running the recreational program for 13-18 year olds, as well as running Referee School Training and organization for both the 5-12 and 13-18 year old groups. In recognizing two community partners, Mr. Singer noted “that without the Township of Derry and the Derry Township School District’s engagement, cooperation and support the community’s rec sports organizations wouldn’t have access the fields and facilities required for their athletes.” Two individuals from these entities whose personal efforts have directly impacted the Township’s residents’ opportunities to participate in and enjoy youth sports in our community were recognized as 2018 Joy of Sports Champions: Scott Govern, Hershey High School Athletic Director and Matt Mandia, Director of Parks & Recreation for Derry Township. Matt Mandia has been with the Township for 24 years. He was recognized for his role in the design and development of Founders Park, Gelder Park, the 13.5 mile Jonathan Eshenour Bicycle and Pedestrian Trail, and most recently, his ongoing work with the development of the New Community Center, all of which have dramatically expanded parks & recreation facilities. Scott Govern has been with the school district since Dec., 2015. He was recognized for his “student first” philosophy to support all student‐athletes in the District with positive encouragement, as well as his strides in building a stronger partnership between interscholastic and rec sports which have enhanced the experiences for the kids, coaches and parents alike. The Joy of Sports Foundation, Inc. was founded with the specific goal of expanding and enhancing athletic opportunities and experiences for all youth in Derry Township. They have worked toward this goal with local recreational organizations, and the Derry Township athletic community at large, by providing information about recreational programs available to our youth, workshop and training opportunities to coaches, parents, and volunteers, and monetary support of various youth recreational sports related initiatives.